DES MOINES – Don Ortman knows Promise Community Health Center. The 48-year-old principal at Rock Valley Elementary School has been actively involved every step of the way since a steering committee was formed to study if there was a need to establish a community health center in northwest Iowa – a few years before Promise even opened its doors in July 2008 in downtown Sioux Center. He has been on the Promise board ever since. 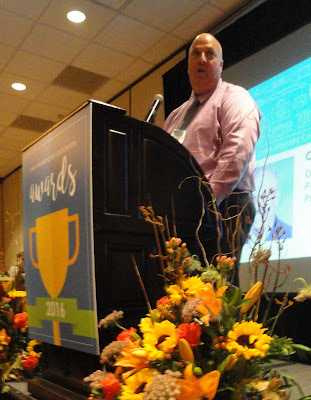 For his longtime, outstanding contributions to Promise, Ortman was awarded the 2016 Carl Kulczyk Memorial Award by the Iowa Primary Care Association on Tuesday during its annual conference in Des Moines. The award was established in recognition of Kulczyk’s contributions to the Iowa PCA and the community health field prior to his death in 2008.
for 2016 on Tuesday, Oct. 18, during its annual conference. “I’m very humbled, and I’m very honored,” Ortman said during his acceptance speech. 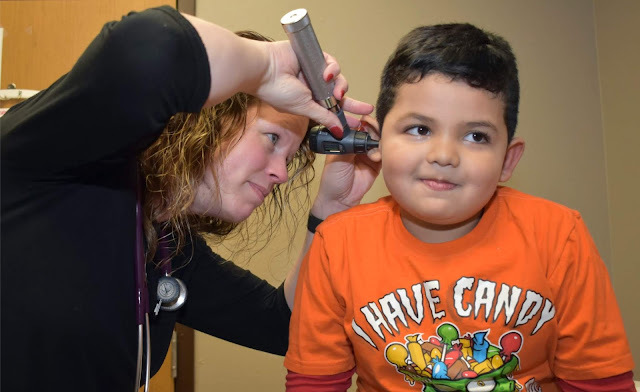 Nancy Dykstra, executive director for Promise, said Ortman always has been a passionate advocate for Promise – recognizing that many families face challenges to accessing affordable health-care services, even as basic as students in his school dealing with head lice. She noted he has positively impacted Promise in many ways, including guiding the health center through its most challenging years as board president when it did not have any state or federal funding, organizing the inaugural celebration fundraising dinner eight years ago, delivering unexpected encouraging notes and signs to boost staff morale, and leading the early marketing efforts to spread the news of what Promise could offer families. And much more. In addition to connecting families to needed primary health care and other essential services at Promise, Dykstra added that Ortman has impacted his community in many other ways. A few examples: He was one of the first to welcome immigrant families and help them find housing and essential items; he helped to lead the recovery efforts in Rock Valley after the devastating flood in 2014; he coordinates a monthly community meal. Ortman said establishing a community health care in Sioux County was important to provide affordable and preventative care to less fortunate individuals and families and to help eliminate the barriers people have to receive the care that they need. He recognized the need to serve the growing Spanish-speaking population with translators so they could communicate with health-care providers in their own language. He noticed situations where families were being denied health care because of unpaid medical bills and where people were ending up in hospitals or emergency rooms because they weren’t receiving preventive care. In particular, he knew of a woman who could not get important preventative heart care until her 65th birthday when when she went on Medicaid. By that point, severe heart damage was already done. Kulczyk Memorial Award on Tuesday. Ortman has played an integral role in overseeing Promise’s development throughout its history. He watched Promise open with state incubator funding and later become a Federally Qualified Health Center Look-alike. He saw it gain FQHC status and receive federal funding in 2012 after navigating its leanest years. He saw Promise add various services throughout the years to its initial primary medical care, including prenatal care by midwife providers, dental care, mental health care and vision/eye care. Ortman said the yellow tin exterior of Promise’s building doesn’t reveal the beautiful facilities and services being provided on the interior to people of all income levels – not just the less fortunate and at-risk populations that Promise targets. In the years ahead, he hopes Promise can continue to develop its relationship with the local hospitals and clinics “because they need us and we definitely need them.” As one aspect, he hopes that eventually leads the ability of Promise’s midwives to deliver babies at a birth center or being granted delivery services at local hospitals. Ortman fondly reminisces on his many years of service on Promise’s board. And how does he assess Promise’s health right now? Don Ortman grew up in Battle Creek and graduated from high school there in 1987. He earned his bachelor’s degree in elementary education from Buena Vista University in Storm Lake in 1991. He then taught in the third and fifth grades and coached girls basketball, volleyball and track in the Griswold School District. He completed his master’s degree in school administration from Northwest Missouri State University in 1996. In 1997, he accepted the position of principal at Rock Valley Elementary School, where he has served ever since. He has received various awards, including Iowa Elementary Principal of the Year and National Distinguished Elementary Principal in 2003, Iowa Character Counts Administrator of the Year in 2005, and Iowa Reading Association Administrator of the Year in 2007. Ortman authored, “The 4th of July,” which is dedicated to the patriotic communities he has lived in. ALTON – The food would have ended up in the landfill. Instead, Rod Hofmeyer of rural Alton discovered a way to provide that good food to hundreds – even thousands – of people throughout northwest Iowa. It all started by him personally delivering small quantities of food from the former Advance Brands plant in Orange City to families more than a decade ago, but it has blossomed into a rapidly-growing ministry – Zestos – that provides food, clothing and other necessities, and housing to people who need it. in need in northwest Iowa, establishing the Zestos ministry. at Terrace View Event Center in Sioux Center. But Hofmeyer is the first to tell you that it wasn’t him doing anything. It was God opening the doors all along the way to give him the means to feed the hungry and care for those in need. Even the passions that drive him in his ministry were given to him by God, he said. But people have taken notice of his servant outlook – and that of his wife, Jayne, who has been a partner at his side in the effort throughout the years. For their selfless service, Rod and Jayne Hofmeyer will be presented with the fifth annual Addink Community Service Award during Promise Community Health Center’s “An Evening of Promise” on Thursday, Nov. 3, at Terrace View Event Center in Sioux Center. They were selected after being nominated for the honor by multiple people. Amanda Bahena, an attorney for Woods, Fuller, Shultz & Smith of Sioux Center, said she had the pleasure of working with the Hofmeyers as they walked alongside a community member dealing with legal issues. The seeds to Zestos – which was officially incorporated as a nonprofit agency in January 2009 and now is based in Alton – were planted many years before the organization ever was formed. Rod Hofmeyer, who was working at Advance Brands, started hauling away trailers of food items – ranging from chicken nuggets to hamburgers – given to him by the plant to feed to his hogs and cattle on his small rural Alton farm about 15 year ago. It was a win-win for both parties because the plant would have incurred the cost of landfilling food waste, which had fallen on the floor or couldn’t be used for other reasons, and he was getting free food for his animals. But, Hofmeyer started noticing a couple of years later small quantities of finished food product that were different – food that came from damaged cases – mixed in the bulk containers of food he was receiving. He asked questions and found out nothing was wrong with the food. “Naturally, I thought, here’s a chance for us to help some people,” Hofmeyer said. At the consent of the plant, he started receiving that food separately. Initially, he and a few church volunteers filled freezers with the food and delivered it directly to families who would be blessed by it. But the food opportunity increased greatly when he started getting pallets of food from the plant’s test kitchen where bulk recipes were being tried out. As the years passed, the collection of food donation has expanded to many other sources, including groceries, restaurants, warehousing facilities, processing plants and farmers who donate animals for butchering. That allowed Zestos to manage the loss of its first primary food source when Advance Brands closed in Orange City in 2012. As food supplies increased, Hofmeyer began talking to people in churches in Orange City about establishing a community meal, which now is called The Shepherd’s Table, as an outreach to struggling people in the community. The first meal drew 70 people in 2009; the next month was double that. It has remained steady since. After the meals, the people in attendance are given grocery bags full of frozen food and bakery items from Zestos to take home. That fellowship meal concept has spread in the years since to over a dozen communities across northwest Iowa, including Sioux Center, Rock Valley, Le Mars, Sheldon and Hawarden. Zestos still provides the bags of frozen groceries, canned goods and bakery products for people to take home at many of those community meals, but some communities have made the events entirely their own. People also can pick up food directly from Zestos in Alton. Food now is distributed to well of 1,000 people every month. To be sure, the Zestos ministry has gone beyond meeting people’s food needs. people who have various needs in northwest Iowa. Zestos maintains a supply of clothing, furniture and other household items that it can provide people at no cost to fill immediate needs. It also operates The Shepherd’s Closet retail outlets in the former OK Cafe in Alton and in a downtown Le Mars location. Those stores serve a dual purpose of providing a revenue stream to support the Zestos ministry and making goods available to people at affordable prices. The Shepherd’s Fold program of Zestos provides Christ-centered transitional housing for men, women and children needing a fresh start. The program started about 10 years ago with a mobile home in Orange City, but four small apartments now are located in the former OK Cafe in Alton. Hofmeyer can tell heart-warming stories of people who have been helped, including a Mexican-American woman and her children after her husband had been deported. The family now owns its own home in Le Mars. With each ministry opportunity, Hofmeyer explained how God laid roadblocks in the way that he might not have understood at the time. Yet, each time, God later opened new and much better scenarios for them to more effectively serve people. Most importantly, he said it was God who put the passion in his heart to serve people in need. After high school, Hofmeyer went through a period of his life that was “pretty self-indulgent, pretty reckless and pretty irresponsible.” He ended up in Denver and later Las Vegas, where a total stranger approached him and brought him to a man who ran a ministry house. Hofmeyer had a strong distaste for him at first, but he ultimately became a mentor who helped to turn Hofmeyer’s life around. Another "wake-up call" for him was when he experienced heart issues a few years after he and his wife, Jayne, moved from New Mexico back to his family’s farm place in rural Alton in 1992. He realized that he should not delay to act if he truly wanted to make an impact in this life. The passion that drives him keeps motoring on – and getting stronger. Rod Hofmeyer pointed to the Bible passage Revelations 3:15-16, which calls on the church in Laodicea not to be lukewarm. He said the Greek word “Zestos” means “boiling hot” and to have “a fervor of mind and zeal; to be zealous in the pursuit of good.” Therefore, the mission of Zestos is to be boiling hot, not lukewarm, in its zeal of following Jesus Christ’s call to feed the hungry, clothe the naked and care for those in need. Rob and Sharon Schelling – 2015. Promise Community Health Center will present its eighth annual “An Evening of Promise” Celebration and Fundraiser on Thursday, Nov. 3, at Terrace View Event Center in Sioux Center. The event, which serves as Promise’s primary fundraiser every year, will begin at 6 p.m. Doors will open at 5:30 p.m.
Silent auction to support Promise. Ticket sales for “An Evening of Promise” will run through Oct. 26. Tickets are $40 for adults, $20 for youth ages 4-17 and free for children 3 and under. They can be purchased online at www.promiseevent2016.eventbrite.com or in person at Promise CHC, 338 1st Ave. NW, Sioux Center. For more information or to request a paper ticket form, please contact Derrick Vander Waal at 712-722-1700 Ext. 150 or derrick@promisechc.org. A ticket form also is available at this link. To learn more about the event, read this preview story. SIOUX CENTER – Hey, Dordt College students, faculty and staff! The community has been given its chance to participate in the pink #DCsis2sis selfie challenge for Breast Cancer Awareness Month. The campus challenge will work slightly different. You are asked to wear pink on campus for Pink Out Days on Oct. 12, 19 and 26. 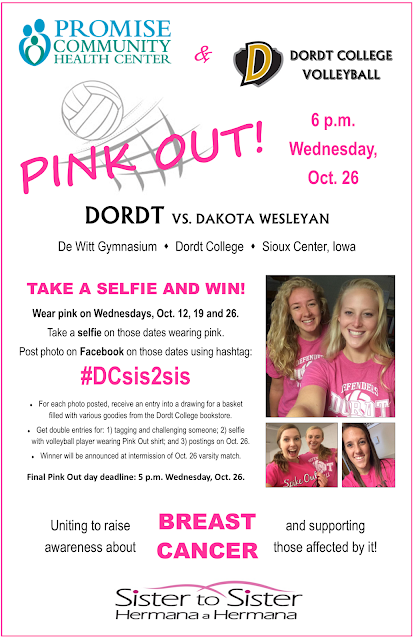 Then, post selfies of yourself wearing pink those days on Facebook – using the #DCsis2sis hashtag – to raise awareness about breast cancer. By doing so, you will be entered into a drawing to win a gift basket of Dordt memorabilia from the Dordt College Bookstore. Check out how you can gain extra entries into the drawing in the expanded description of the guidelines in the flyer to the right or at this link. The drawing will be conducted at intermission of Dordt’s varsity volleyball game against Dakota Wesleyan on Wednesday, Oct 26. That is Dordt volleyball's official Pink Out evening conducted in partnership with Promise Community Health Center’s Sister to Sister/Hermana a Hermana program, which provides breast cancer awareness and education and free mammograms and other screenings to uninsured and under-insured women. You do not need to be present to win. Selfies on final Oct. 26 Pink Out date must to be posted by 5 p.m.
To learn more about the community challenge, read this story. 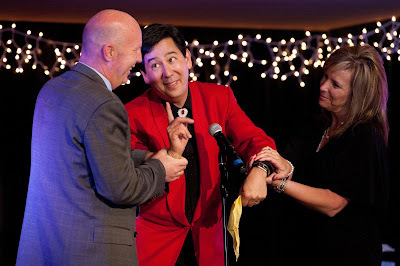 SIOUX CENTER, IOWA – Magician David Hira instantly fell in love with magic and theater when he saw his first live magician as a child at a car show at McCormick Place Convention Center in Chicago. That stirred in him the desire to begin performing his own shows when he was in junior high while growing in the suburbs of Chicago. Terrace View Event Center in Sioux Center. 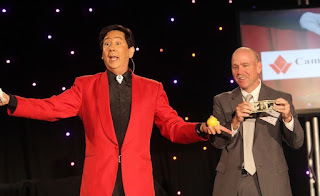 As he developed as a performer and magician, he was inspired by watching master magicians Mark Wilson and David Copper on television. He’s still doing that decades later at 55 years old. Hira, who lives in Dallas, TX, and has ties to northwest Iowa, hopes to bring that same sense of inspiration to the audience at Promise Community Health Center’s eighth annual “An Evening of Promise” Celebration and Fundraiser on Thursday, Nov. 3, at Terrace View Event Center in Sioux Center. Hira has traveled the world to perform at venues ranging from Caesar’s Palace in Las Vegas to his most recent venture on a cruise ship departing from Rome into the Mediterranean Sea, but his performance in Sioux Center will not be just any performance. It will be extra special – a homecoming of sorts for him. He has many fond memories of spending time as a child on the rural Rock Valley farm of his grandparents, Ted and Francis Kooima. His mom, LaVonne, grew up as one of seven children along with Lloyd, Marilyn, Linda, Lyle, Roger and Carol, so he also had various aunts, uncles and cousins living in northwest Iowa – with his family tree branching out in many directions from there in the area. In fact, his relatives established the Kooima Co. and various other businesses in the Rock Valley area. "An Evening of Promise" in Sioux Center. As his love for magic was revealed in junior high, Hira was lucky to have another magician in his school, David Howard, who was a year younger and had a twin sister. Their mother owned a dance studio. By the eighth grade, Hira had decided that he wanted to take Johnny Carson’s place one day. 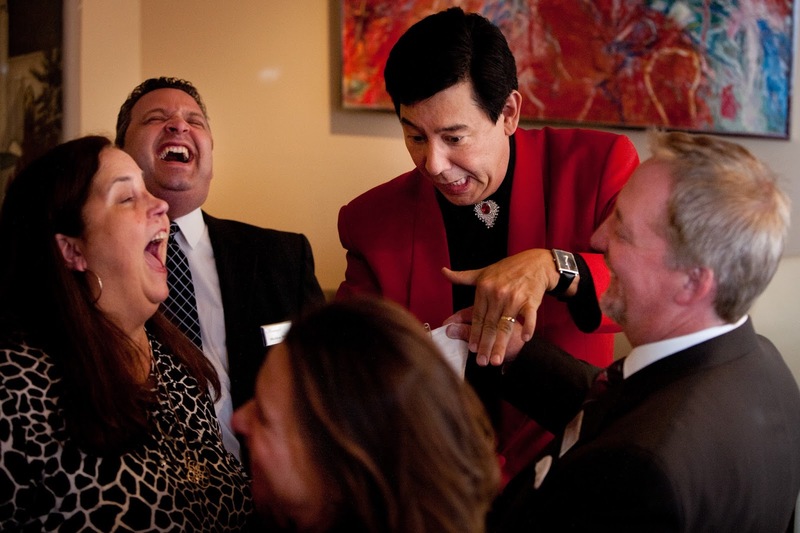 Johnny, the iconic host of “The Tonight Show” for 30 years, had started out as a magician, as did many other TV celebrities. Though the job ultimately went to Jay Leno, the dream was enough to propel Hira in the right direction. Hira was able to make money in high school and college as a magician. It was a “great perk” having people pay him to have fun, he acknowledged. His career progressed from there. Throughout the years, Hira has appeared in 44 states across America and in a host of other countries, including Puerto Rico, Mexico, New Zealand, Australia, Spain, United Kingdom, Italy, France, Japan, Canada and Costa Rica. 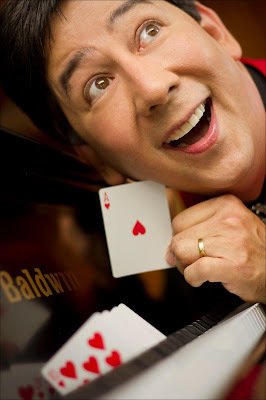 He has performed on cruise ships in beautiful places such as off as the coast of Alaska and in the Mediterranean Sea. Next year, he is booked for a luxurious cruise ship that leaves out of Rio De Janeiro and goes up the entire coast of South America, down the Amazon and winds up in Barbados. His wife, Angela, is excited to be accompanying him for that trip. Hira said he’s trying to slow down but “not succeeding very well.” In 2014, he performed or was the keynote speaker at 417 events in 17 states and five countries. His goal was not to perform at more than 300 events in 2015, but he well exceeded that number. “I can’t wait for the chance to brag to people that I performed in Sioux Center, Iowa,” he said with a grin. One of his most rewarding gigs is as the CFO (chief fun officer) for Snowball Express. For the past six years, he has coordinated the fun for children of fallen military personnel who were serving active duty since the Sept. 11, 2001, terrorist attacks. Each December, they bring in 2,000 children and their surviving parent to Dallas to give them a four-day Christmas that “they’ll never forget.” As the face of the event, Hira plays host and master of ceremonies for the shows that he produces for the children. of Promise" on Thursday, Nov. 3. “To be in awe of others is to honor their creator,” he added. In fact, Hira considers the chance to be around wonderful people – people he had not yet met – to be like magic to him. He remembers that thought as he astonishes people with his magic during his performances. As he entertains, he gives the gift of laughter. Hira also will weave his fond memories of northwest Iowa into his “An Evening of Promise” performance in Sioux Center. Promise Community Health Center of Sioux Center is the only Federally Qualified Health Center serving the far northwest corner of Iowa. Promise provides medical, dental, prenatal and behavioral health services. To learn more, visit www.promisechc.org and watch this video. David Hira and his wife, Angela, have three married children, Amy, Michael and Eric, and a 2-year-old grandson, Ezra. He is a foodie and loves to try all kinds of food adventures. His hobby is Costa Rica “in all ways.” His favorite thing to do is to encourage others in any way that he can. David Hira said his performance will be much more than a magic show.